The breeding program assessment tool (BPAT) is based on the key elements that drive a public sector breeding program’s ability to achieve higher rates of genetic gain, including: breeding-specific execution and impact factors and enabler support factors of strategic planning, budgeting, and performance management. Each institution is assigned a 1-4 score per question based on the organization’s current capabilities. The tool is anchored by a perspective on best practices in public and private sector breeding programs. The assessment will contribute to a strategic plan for the institution to achieve higher rates of genetic gain. BPAT is a tool to outline an improvement plan so that all investments are successful in achieving those objectives. There is no “bad” score but rather a process to identify strengths and weaknesses. Accurate scoring is critical to ensure that gaps can be addressed in the grant making process. Institutions are encouraged also to use the tool for self-improvement regardless of donor direction. The assessment process has been developed and tested with experienced breeders. 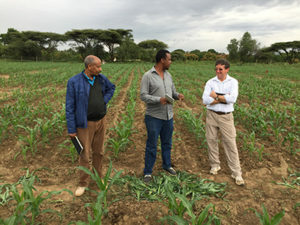 The tool has been developed and refined by a team of former public and private sector breeders, agriculture and change management-focused consultants, and BMGF staff.